First things first: Jeanette, I still intend on honoring our standing lunch date for this place. And onto the review. 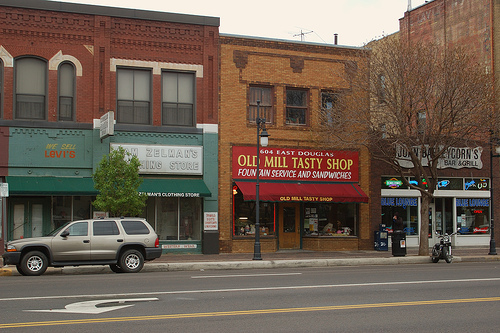 First, I love the charm of these types of buildings in Old Town, downtown Wichita, and Delano. Some people say the small restaurants don’t give as consistent of service, but I will say, hands down, this has been some of the BEST service I’ve gotten in awhile. I wish I’d paid attention to our waitress’s name. I’m such a selfish consumer. Anyway, when our waitress found out we were first time customers, the first thing she did was bring us a taste of their chicken salad. I’m NOT a chicken salad fan, but this stuff was actually good! Good enough to order a sandwich? Maybe. But I didn’t. Seems like more of a summer food. So I’ll be back. I’ll get that along with the ice cream concoction I dreamed about but was too cold (and full) to get. Crap, I’ve derailed. OK, so after we had the chicken salad I told her I definitely wanted soup. They had all kinds of options, regular chili, green chili, tomato bisque and KC strip steak soup (which she said is like hamburger vegetable with steak). I thought she also said potato, but I might have misunderstood. She talked faster than my brain could comprehend. When I asked for her suggestion and she told me they all were good, I was at more of a loss than ever. Her solution? She brought samples for us to try! Awesome! I ultimately decided on the green chili because I’ve never had it as a soup before (but now have added it to my “things I need to learn how to cook” list), and the sample was delicious. Kathy got the tomato bisque (which was also delicious, and usually I’m a sucker for tomato bisque). The steak soup was good as well. 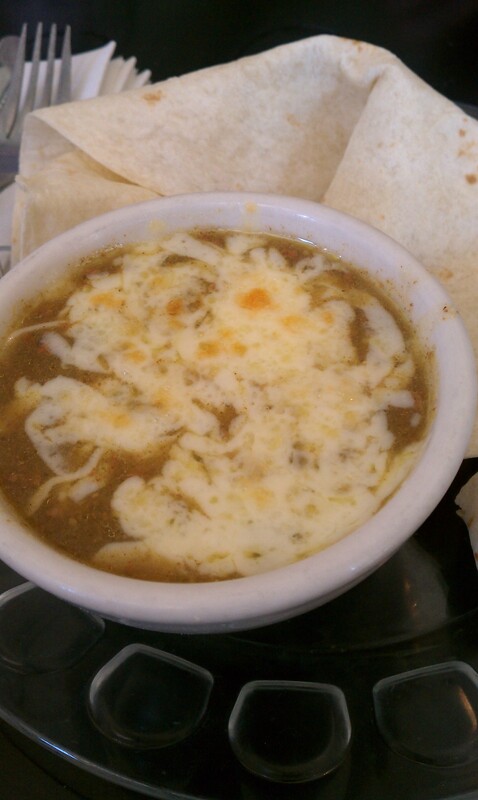 But I was mostly curious to eat a whole bowl of the green chili. Kathy also got a half a grilled cheese. I can’t remember the full contents of their childrens’ menu, but there IS a menu. 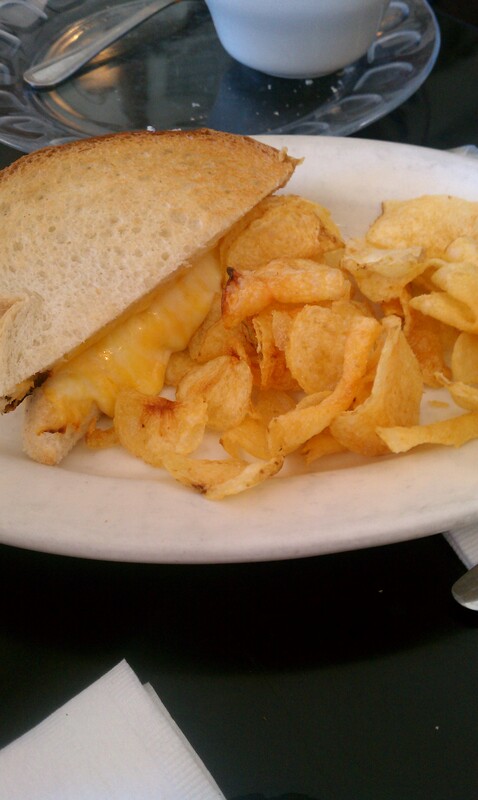 The grilled cheese came with a side of chips. And I got a half of a turkey sandwich, which came with a side choice of chips, potato salad, baked beans and a salad. I originally said chips because I didn’t think I’d even need a side with my soup and sandwich. But got talked into baked beans. I’m NOT a baked beans or potato salad fan. At summer BBQs I eat pasta salad and drink beer. And Sara got the chicken fried chicken meal that was on special. Everything was delicious. Even the beans, I’m told, which I ended up taking instead of the chips. I still didn’t like them. Not because they’re gross. I just don’t like baked beans. I’m told my mom makes a mean baked bean. But I don’t like them, either. Hey, sometimes a girl just doesn’t want to eat that cooked carrot, even if you say it’s delicious. Oh, wait. That’s a different story. One thing we didn’t get that we wished we had were sodas/pops. They make them using the real soda fountain technique (we watched as we went up to pay). They put the syrup in the cup of ice, then add the soda water and stir it up. In OMTS’s defense, the waitress DID tell us this. But I’d never seen it done before, so I had no idea. Next time we go back we’re having ice cream and sodas. Bottom line: Go. It’s delicious. I think they’re only open for lunch, except for nights where there are big events (like at the arena). And in that case, I’d rather stay out of Old Town, anyway! I’m not sure what their hours are on weekends, however. And I’ll tell you, the tables were packed the whole time we were there, but they serve tables quickly, and we only waited a few minutes to get a table. So while you might have to plan to wait for a minute or two for a table, they get your food out quickly enough that you’ll make up for any lost time. And, after we’d eaten I asked Kathy (who was begging for McDonald’s on the way to lunch) whether she’d rather have had McDonald’s or eaten at OMTS. She adamantly said OMTS. Wow! I can’t say I would have said the same at her age. So, kudos to Sara for raising an open minded daughter! And kudos to OMTS (who I hope doesn’t care I’m acronyming their name, you know, as if they’ll ever read this). Well played, Old Mill Tasty Shop! Son of a bisque! Yummy! 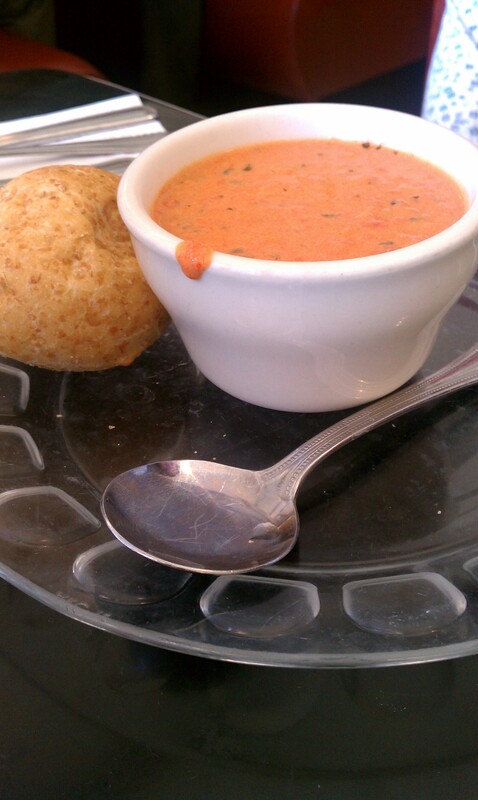 This soup came with a tortilla bigger than my face. Seriously. I didn’t even know they made tortillas this big. I’m not sure that it was homemade. But it was recommended to smear it with butter and dip it in the soup. The only thing that would have made it better would have been if the tortilla was warm. But delicious none the less. Grilled cheese on homemade bread. Delicious. I know there were at least two different kinds of cheeses. And while I love cheese more than my left pinky toe, I have no idea what cheeses. I got a bite of a corner with the nice crunchy cheese on the edge. Mmmmmm… I don’t need anyone to tell me there’s a heaven. I eat grilled cheese, and I believe. 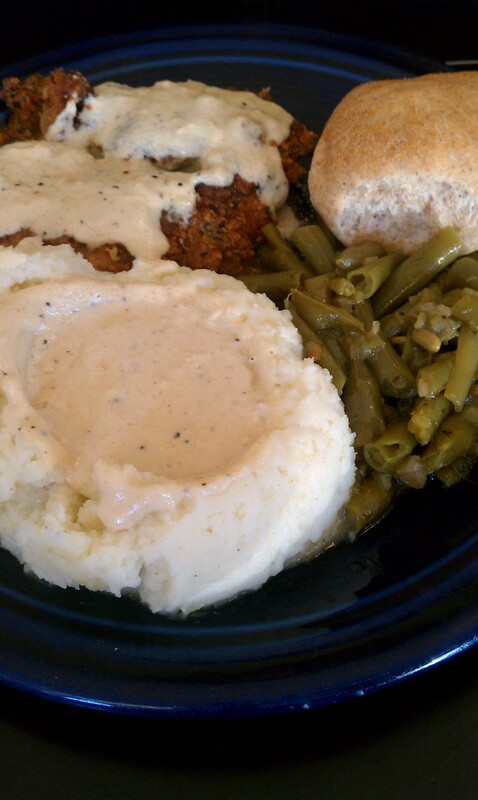 Sara’s chicken fried chicken, mashed potatoes and green beans. I tasted the fried chicken and said, “I’ve never had my grandma’s cooking, but I have to believe this is how it would have tasted.” Seriously, it wasn’t like that KFC crap (no offense intended, although I guess it’s implied). It was deliciously flavored breading. Mmmmm. And I’m not even a huge fried chicken fan! And my turkey sandwich on homemade bread. Kristy would have loved this bread! 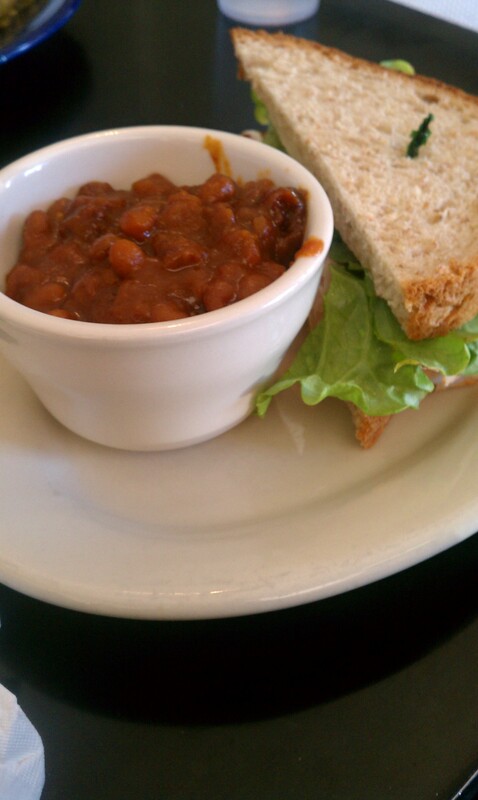 With a side of baked beans, which Sara confirmed were as delicious as the waitress suggested. At least “The Monella” will help you win our weight-loss challenge. ;) I mean, there’s no other chance you’re gonna beat me. I thought you gave up? Crap! And I’m making cinnamon rolls! I definitely want to try it now! I’ve only been once but it was long ago.